Happy Holidays by Bing Crosby is blaring from my suegra’s old beat up radio. There are huge cooking pots on the stove of meats, smoky liquids, and the smell of coffee beckoning me inside. In the middle of the room is a pot of masa the size of a kid’s swimming pool waiting to be kneaded. 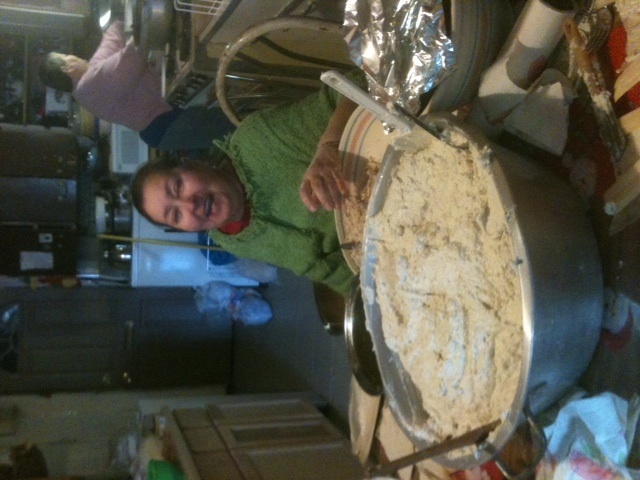 My suegra and I are elbow deep in tamale masa. The masa feels alive in my hands the way wet clay feels when you are preparing to shape it into something beautiful. We continue to coax the masa with our hands so it finds the form it needs to turn into an army of tamales. It makes me wonder how we can take our creative masa and shape it into something that nourishes ourselves and others. The tamale, like our creativity, is a regalito wrapped in a cornhusk waiting to be unwrapped, to delight in and share with others. When I come back with the cooking pot I am still dazzled by being surrounded by so many pots and pans. Doña Maria begins to tell me all kinds of wonderful stories about her life. She is especially nostalgic of the navidades with her siblings in a pueblito called San Jose de Las Flores, Jalisco. Suddenly there is a loud knock at the door. She even brings her own special wooden tamale spoon to slather the tamales with. I cringe when I see it because it reminds me of the wooden spoon my mom would use to discipline me. 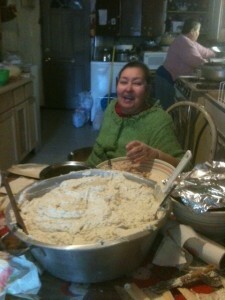 She eyes me suspiciously and says “Who is helping you with the tamales?” My suegra points to me and I smile. We begin to assemble our ingredients around the table and start slathering masa and meat into the cornhusks. Tía Carmen eyeballs my tamales and takes one and says,”no, haci no, I used to pinch my daughter if she didn’t slather them right.” I laugh and say, “Lucky for you I would pinch you back.” She laughs and shakes her wooden spoon back at me and begins to tell us a story of navidades in Chicago. Coming together with Doña Maria and Tía Carmen to make tamales and share stories made me reflect on the ritual of women coming together the way we do at Proyecto Latina every month. Telling our stories at every age in our life is such a gift. I’m so thankful for our ritual of creativity and storytelling that we do because each one of our features, open mic participants and audiences members are part of a vibrant ritual of cultivating creativity and giving each other the gift of our stories in primera voz. Feliz Navidad Everyone!